If your company is like most companies, your leadership team uses line graphs, bar charts and "heat maps" to try to manage operations. The problem with these charts is that they barely graduated from high school and now you're leting them run your company? I have found that too many managers and leaders react to noise in the data, sending employees off on wild goose chases to figure how why a number is up or down this month. In doing so, they often miss the signal that exists in the data. You might consider using charts that went to college and took statistics; charts that are smart enough to help you detect and respond signals quickly and ignore anything that isn't a problem. 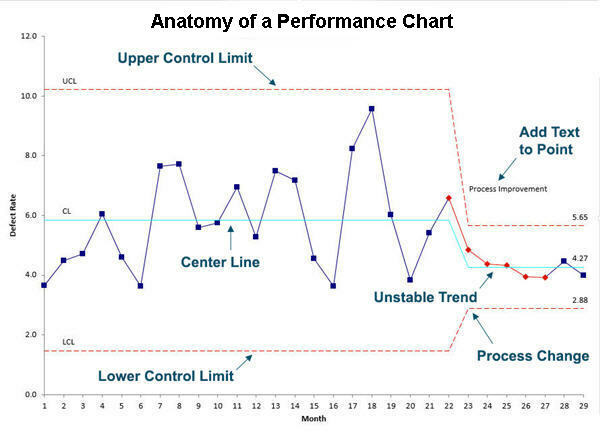 A Performance Chart can tell if your process is stable and predictable like my parents were when I was growing up, or wildly out of control like a college student on Spring Break. A Performance Chart evaluates how a process performs over time and alerts you to problems before they become catastrophic. Performance charts can also help you ignore the noise	in your data that is simply normal day-to-day variation. A line graph of data that shows how a process performs over time. A Center Line calculated from the data that represents either the average or median. An Upper and Lower Control Limit (UCL/LCL) line which is calculated at 3 standard deviations above/below the Center Line. Stability Analysis highlights unstable points or trends to be investigated. In a stable process,997 out of 1,000 data points will fall between the upper and lower control limits. A point outside of the UCL/LCL is unlilkely. It should only happen 3 times out of 1,000. It's cause for investigation. Similarly there are trends (like the one shown below) and other statistically unlikely conditions that should only happen 3 times out 1,000. ChartSmartXL will alert you to their existence so that you can take actiobn to correct the process. Point - select your data in an Excel worksheet. Click - on the ChartSmartXL Menu and Performance Chart Wizard. The Performance Chart Wizard will select the right one for you. Analyze and Improve - ChartSmartXL will do the calculations and draw the Performance Chart. It will also highlight unstable conditions that should be investigated in red. View a complete list of the Performance Charts in Excel you can create using ChartSmartXL. Why Choose ChartSmartXL Over Other Performance Chart Software? Performance Chart selection rules are built right into our software code so you don't have to memorize them. This enables our Performance Chart Wizard to analyze your data and select the right chart for you. Once you create a Performance Chart, its easy to update or customize it using the ChartSmartXL Chart Tools Menu. Add data, notes or goal or target lines to Performance Charts. Change the data points used to calculate control limits. Re-run stability analysis after changing data or control limit calculations. Remember and Apply Custom Formats to your Performance Charts. ChartSmartXL has Performance Chart Dashboards. Just input your data sets into the data entry worksheet and click on the Create Dashboard button. ChartSmartXL will generate a Performance Chart for each data set and display all of the Performance Charts together. Great for those updating lots of charts on a regular basis. You don't need to learn a separate software application to create Performance Charts..